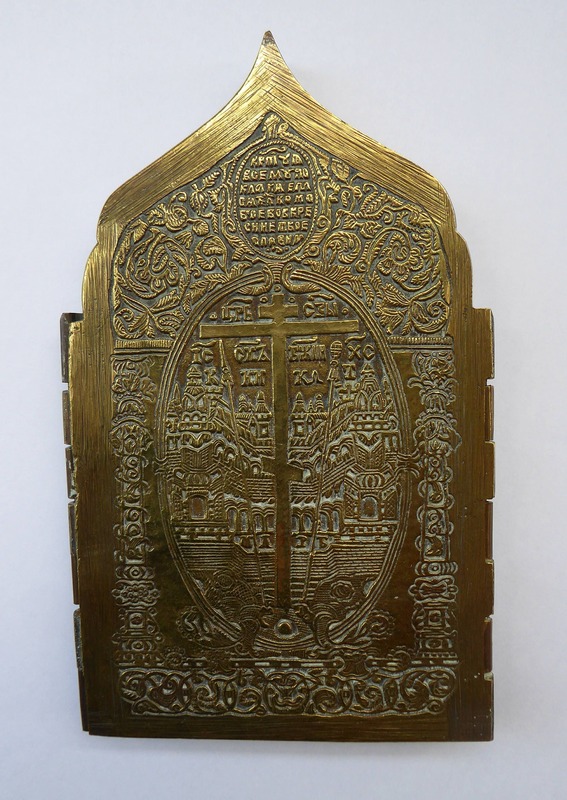 This is a highly collectable antique Russian quadriptych travelling icon shrine or iconostas, which would have been used by pilgrims travelling to Holy sites. 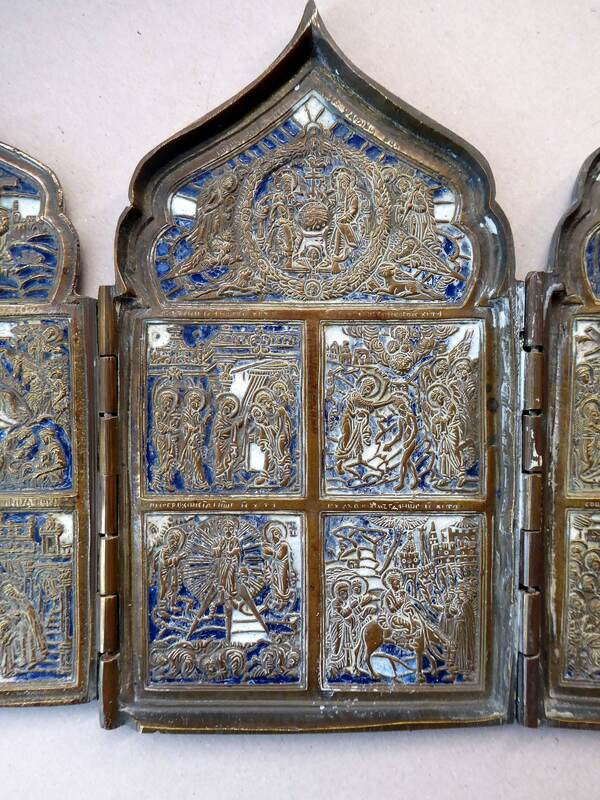 It is quite a large and heavy example - and consists of four separate panels each with an ogee shaped top. 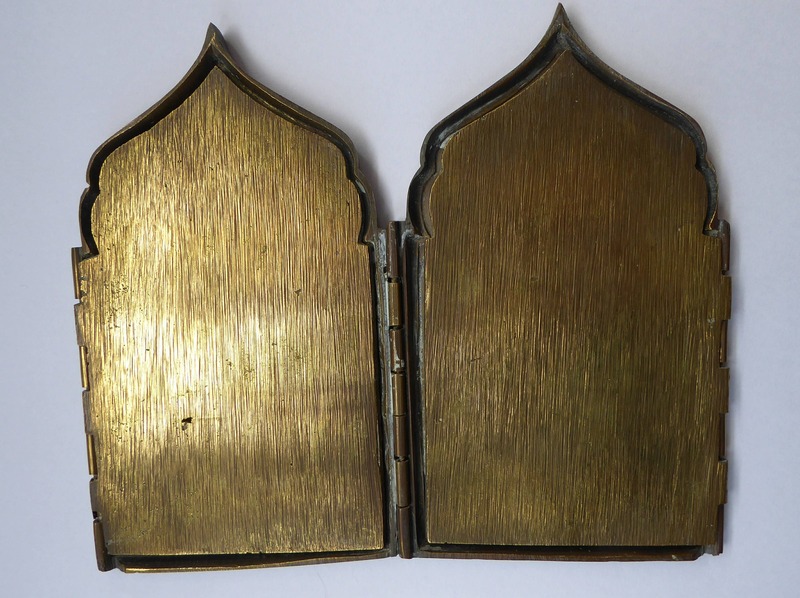 These are hinged together to form a standing iconic for your dressing table or bedside cabinet when travelling. 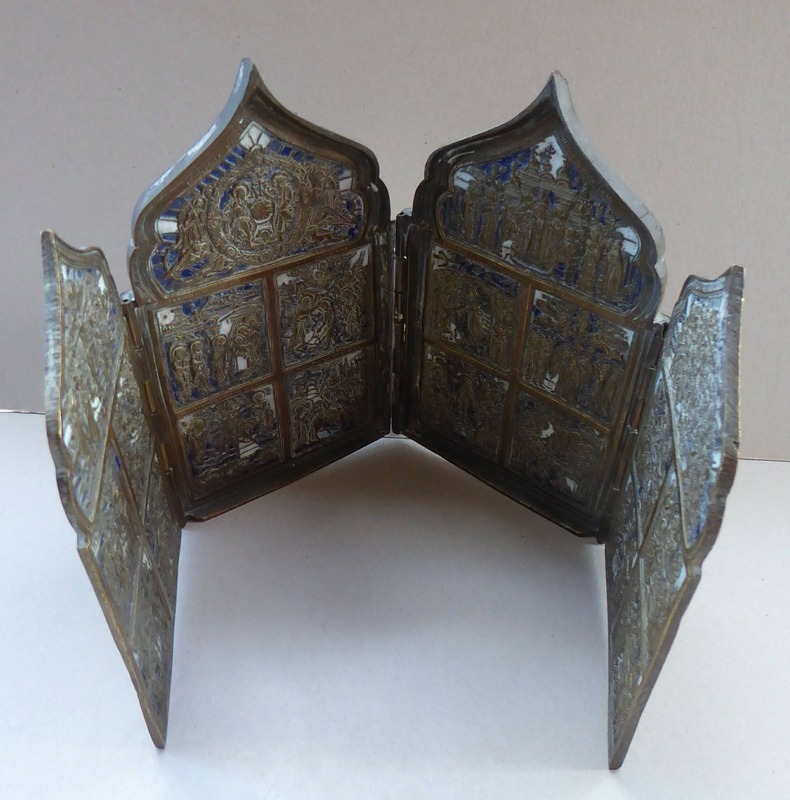 I am not sure of the date of this example - I am dating it to being 19th Century in origin, possibly even a bit earlier. It is certainly not modern. It was probably also made in Moscow. 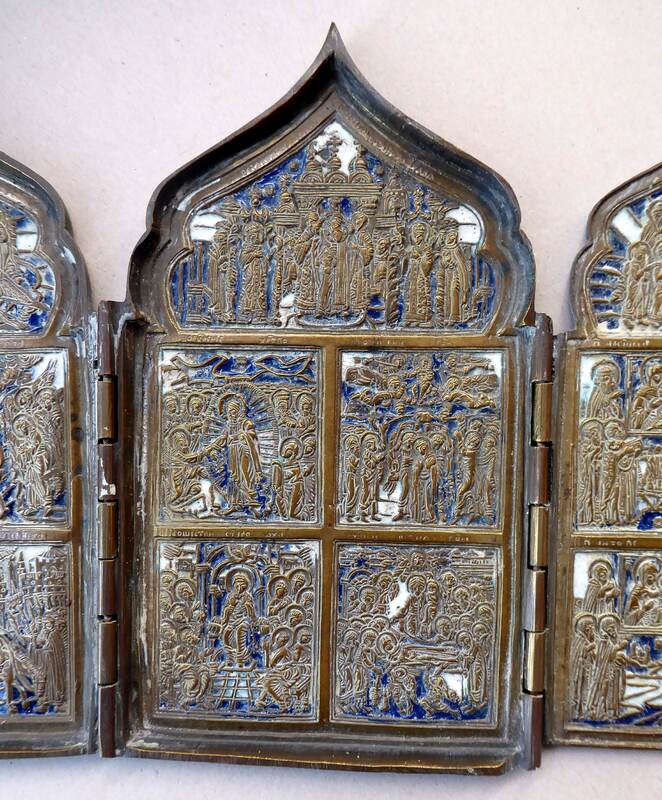 The front panel of the quadriptych shows a Russian cross contained within an oval with a Russian palace or monastery in the background - the central image is surrounded by intricate foliate decoration. The decoration is very fine and crisp with no damages. 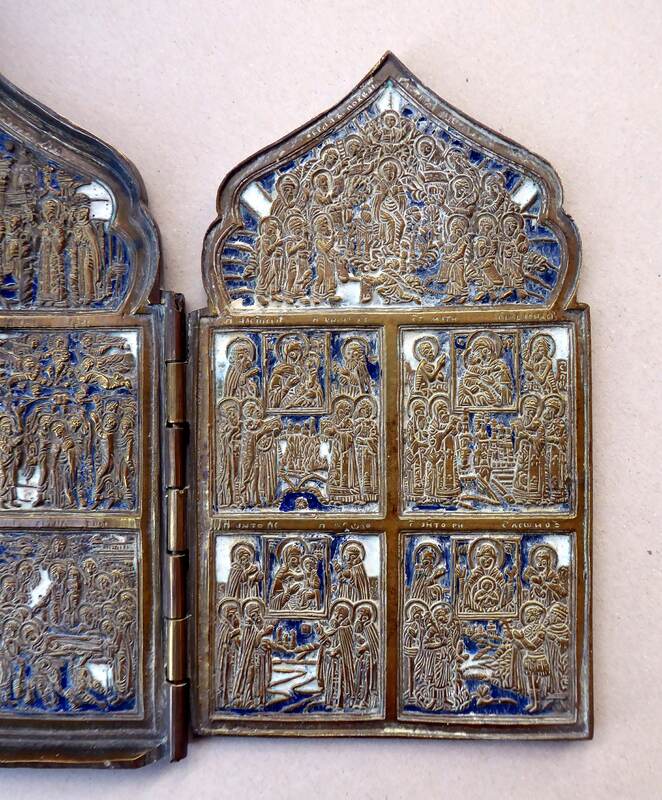 When you open up the four leaves (all on heavy-duty hinges in fine condition and all secure) you can see that each panel is decorated with episodes or little separate images showing episodes from the life of Christ. Each scene is annotated above with Cyrillic or Russian script. 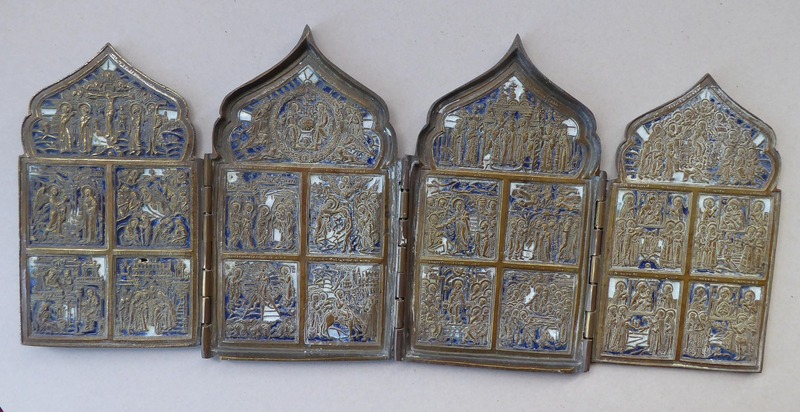 The casting or chasing of each little panel is exquisite and full of detail, much finer on some other examples that I have seen. 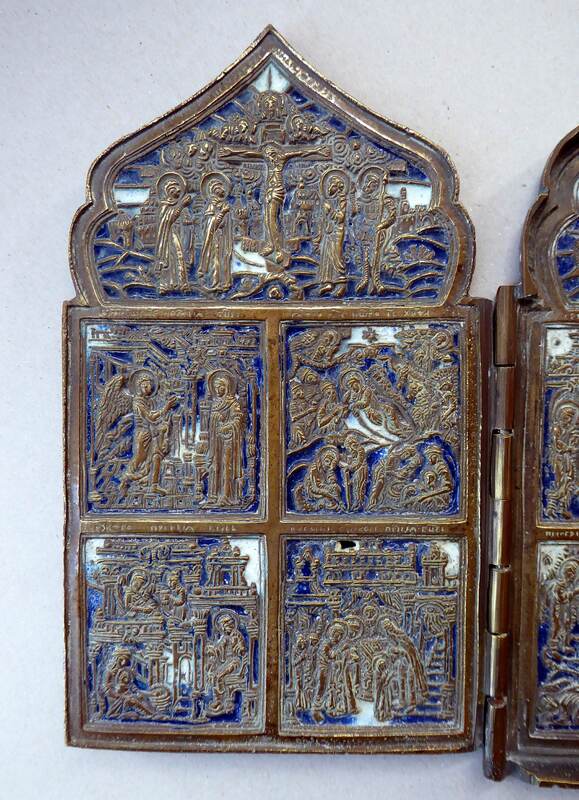 The panels also had some random additions to little areas which are filled in glossy white and dark blue enamels. The back of each panel is blank with a textured surface as this is not seen when all folded up. The icon is in very good condition for its age and use. Sadly, there is one tiny hole to one of the interior panels (at the top of the bottom image on the furthest panel to the left-hand side of the icon) as shown in my photographs. The height of each separate panel is about 6 1/4 inches (16 cm). The width of each panel is about 3 1/2 inches. The overall width of is 15 3/4 inches (40 cm) when fully extended. There is a good bit of weight to this wonderful icon - and it comes in at 1.3 kg in weight. A very lovely and fine example - and offered at a fair price, which takes into account the little condition issue described above. Postage quoted is for next day special delivery with the Royal Mail.